Go to HERE IS TODAY. Click on the screen. It puts your day in perspective in a few clicks. Thanks to @pyuan on twitter for this! You have data. You want to show either the relationship, the composition, the distribution of the data, or you want to compare the data. Which chart should you use? Pie chart? Scatter chart, bar chart? Why not start with this chart? It’s will help you immensely. As you can see, Microsoft makes relatively little on Entertainment (and they lose with Online Services). All their money is made with Office and the Windows OS. And I am guessing with the challenges they are having from non-PC devices like iPads and others, they are having to focus their resources on the big revenue generators. That will likely affect development of the XBOX 720, though I expect Microsoft will ultimately deliver, based on their long reputation of hanging in. Sony has a totally different focus, although they too are being challenged by tablets and the like (as is evident by articles like this: Seven signs PlayStation Vita is a failure (Wired UK)). I expect them to push hard against Microsoft and try and dominant the console market. It will be interesting to see, and I expect gaming is going to see along of shifts in the next two years. 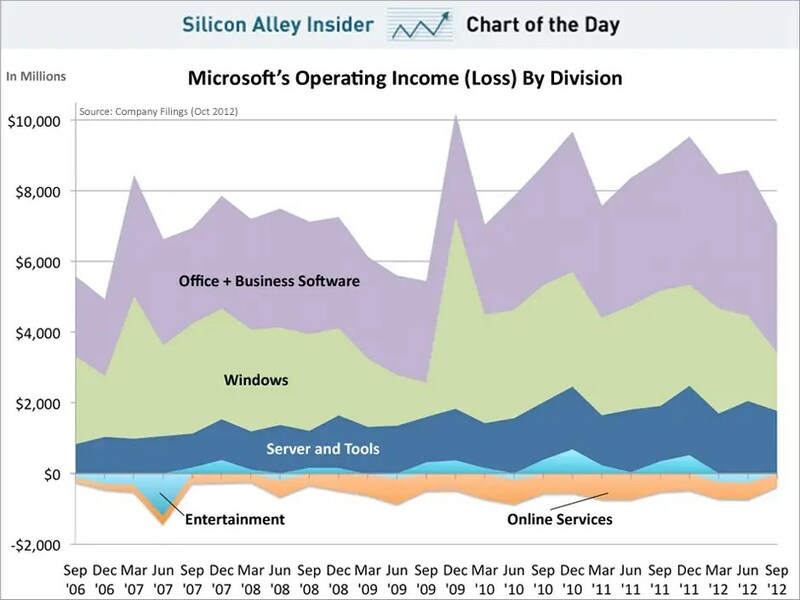 Chart from CHART OF THE DAY: Microsoft Income By Segment – Business Insider. As far as prejudices go, Ageism is a mild one. Perhaps that’s why the Globe and Mail thinks it’s ok to write about it, especially on the topics of food and restaurants. This entire article, Young, hip restaurants? No thanks, I’m happy being the unwanted oldster – The Globe and Mail, is a rant filled with generalizations. While it is fun to read, it is also lazy and indulgent, like much ranting about prejudices is. It wouldn’t be nearly as interesting to have an article that took the time to separate the fashionable restaurants that are good and professional from those that are fashionable and pretentious. Ranting gets more viewers, I suppose. Taking the time to better understand the motivations of restaurants takes longer. There will always be places that cater to specific groups. And when it comes to new and hot restaurants, there will always be those that appeal to young people. Just like there are very established places that appeal only to an older clientele, or a business clientele, etc. And for every restaurant lucky enough to have the attitude of the customer isn’t always right, there will be many many more that strive to meet your needs as a guest. Restaurants are social businesses, and as Adam Gopnik explains in “The Table Comes First”, part of what some restaurants sell is exclusivity. How they exclude, be it price or demographic or social status, is part of their overall strategy to be successful. Some of that exclusivity will eventually filter you out somehow. If you don’t like it, take your business elsewhere. There is a wide range of establishments in Toronto: it’s not a simple divide of either trendy gem or fast food joint. Do some leg work: there are plenty of web sites that provide more information on places to eat. Check out how the restaurant uses social media. I don’t believe every new restaurant in Toronto has a strategy of excluding everyone that doesn’t fit a younger demographic. If they do, then all the power to them: unless they are a pop-up restaurant, they will be joining the deadpool of former restaurants very soon. As far as older people go, I recommend you hold your prejudices to them the same way you would hold your prejudices to any other group, which is to say, you should abandon them. You will be doing so for your own benefit as much as theirs. If you are an IT person or geek like me, chances are you wish you could read more non-technical books that still appeal to your technical side, but that also manage to go into areas that you are not used to reading. While it is easy to find lists of great fiction and non-fiction, there are not too many lists of great books that directly appeal to you as a technical person. I think this list might. I am not the best read person, but I think this is a good list of books to read. Furthermore, I have read each of these books at least twice, and some of them more times than that. David Foster Wallace is one of the great writers of the late 20th century who also really knows mathematics. 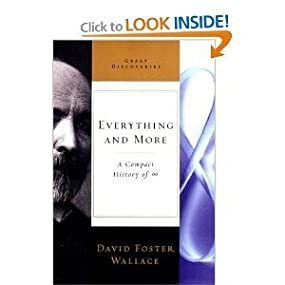 This book wonderfully illustrates the story of mathematics and Georg Cantor while telling the history of the concept of infinity in a way that only DFW can. How many hard science books are written by great authors? There’s one: this one. This book is singularly great: you get superb writing and you get to learn/relearn a lot about mathematics. I know some mathematicians complained about some of the math, but they missed so much by doing so. (Plus, I studied this in university and to my feeble undergraduate mind it looks ok.) I can’t recommend this book highly enough. This book is a gift for people who enjoy mathematics. And math phobes, give it a try. If you like it, read more Wallace. Really, anything is worth reading. And there are other books in this series as well. 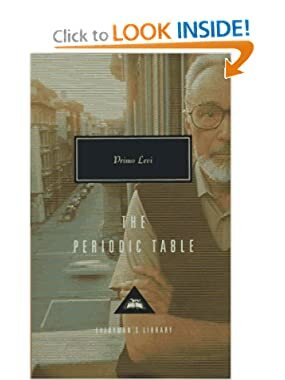 Primo Levi was a chemist, an Italian, and a Jew living during WWII and the Holocaust, and those parts of his life form a complex compound here in this book. Many of the chapters of this autobiography are named after elements in the periodic table, and the story in such a chapter (e.g., gold) is centered on the element. Levi’s love of chemistry and science comes through, and his writing is superb. Any field of science would be fortunate to have a such writer represent it. After reading this, I’ve read more of Levi, and the more I read, the more I’ve appreciated his depth and profundity. This book has that, but with an accessibility that makes me recommend it over his other books. Read this, and if you like this, get his other books next. You won’t be disappointed. Every time I read Levi I take on some of his depth and humanity. If you like Levi and are looking for something similar, start with Italo Calvino’s books or Viktor Frankl’s “Man’s Search for Meaning”. I joke that if science fiction is really good writing, then they don’t call it science fiction anymore. Same with fantasy and other genres. 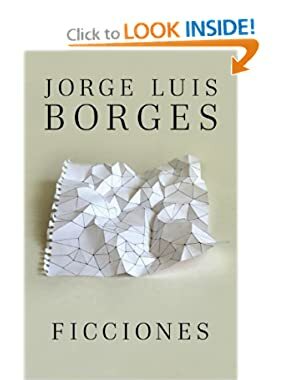 If believe that if you love those genres, you will love Borges. Like Kafka, there are few writers that imagine worlds the way he does. And like Kafka, his writing is superlative. I love science fiction, but I rarely have time to read anymore, and I often feel like I could be reading something better when I am reading it. I think this is a fault of mine, but that’s how I think when I read SF. Borges allows me to feel I am reading great writing and still getting my fill of science fiction and fantasy. You may think I am entirely wrong and you may have a lengthy list of great SF writers that I have neglected. Read Borges, and if you think there are some that approach him in terms of writing, I will be delighted to hear from you. If you like this, try Labyrinths next, also by Borges. Margaret Atwood is another writer who writes SF but it isn’t called SF because she is a great writer. Try her next. And of course, you should go read/reread Kafka. 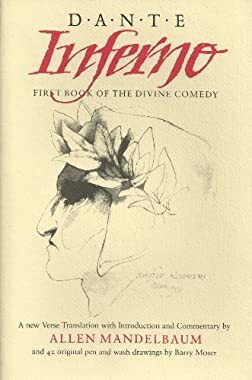 There are a multitude of translations of Dante’s Inferno, so why read this one? First off, the translation is very detailed, and the notes in the back are worth reading as much as the translations themselves. More importantly, Mandelbaum aims to get the poetry into the English translation, and the result reads beautifully. If you can read Italian, you are in for a great feast, for the Italian and the English are across from each other on each page. Regardless, it reads beautifully in whatever language you can read. To top it off, the Moser illustrations are frighteningly good. The superbly horrific illustrations give it feel like a graphic novel. Unlike a graphic novel, though, you get all of Dante’s writing, not just snippets. This book is a feast. I think everyone should read Dante’s Inferno, and if you agree, this is the one I recommend you try. With all the interest in bitcoin, it behooves IT people to learn more about economics. J.K. Galbraith has an entire book on money called “Money” that deals with the history of it. “Money” is a great book, but I love this book more. 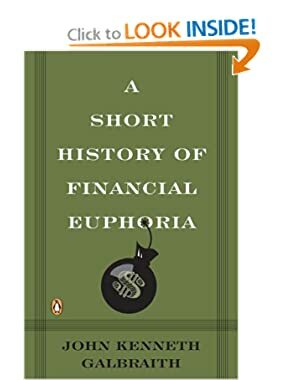 It is a slim volume covering all the manic moments in history regarding money and in particular, financial bubbles. It is written in a very dry and witty style that will make you smile as you read Galbraith eviscerate one historical figure after another who promises: this time it’s different. After reading it, you will be innoculated against bitcoin and all other future movements that again promise this. If you like this, then there is alot of Galbraith you can read, including his essays. I find his ideas still fresh and provocative after all these years, and his histories hold up well. Just as importantly, Galbraith writes well and thinks clearly and skeptically. Even if you can’t imagine yourself reading anything to do with the topic of economics, I recommend you read this. Of course you can also read Paul Krugman, Adam Smith, Karl Marx, Milton Friedman, Karl Popper, and Joseph Schumpeter. Galbraith is funnier. Under no condition can I recommend that you read Ayn Rand, unless you are trapped somewhere with nothing else to read. I tried to cover alot of different types of genres, from biography to poetry to history. One genre that gets overlooked or looked down upon is the Self-help genre. While there are lots of terrible self help books — that is true of every genre — there are some exceptional ones, like this one. I also think this book is de Botton at his best. It’s not a “do this, do that” type of self help book. Rather, it is one that says: think about this, and when you have, your life will be improved. Read it that way, if you must. But if you read it with an open mind, you will get so much more, including a love of and a desire to read Proust. 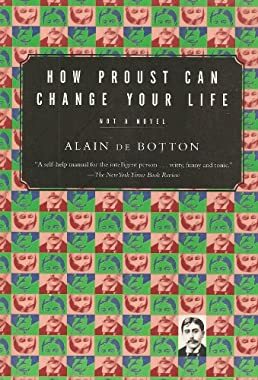 I think that is the Inception thing that de Botton has going on here: if you read this book, you WILL want to read Proust, size be damned. But before you do run off and tackle Proust, read this. It’s smart, witty, clever, insightful, and humane. I’ve ready many of de Botton’s other books, but this is the one that I’ve enjoyed the most. If for no other reason, read it for the part when Proust and Joyce get together. After you do, you’ll no longer bother to think “what would it be like for two great people to finally come together”? This book is smart like an Oscar Wilde play, and just as effortless to read. At the end, you will be thinking long after you stop laughing to yourself. Another great self-help book is Bertrand Russell’s “The Conquest of Happiness”. Read that next. Every year, the CBC in Canada hosts the Massey Lectures. The lectures are then published in book form like this one. The CBC has been doing this for decades, and the quality AND quantity is amazing. If you had to pick a series of books to buy, you could do no better than getting the complete Massey Lecture series. It is an education in itself. One of my favorites is by Stafford Beer. He takes clearly about cybernetics and system design, but then uses it to talk about how to redesign establishments and societies. It says here it is from 1990s, but the lecture was given in 1973. Anyone interested in how IT affects society should read this. If you like this, any of the Massey Lectures are good. (e.g. C.B. Macpherson’s “The Real World of Democracy”). Of course the authors in this anthology are great, but what makes this book particularly great is Kaufmann. Not only is he superb at selecting works to include in this volume, but he even does the translation (or re translation) necessary to bring the ideas across. You might think: that looks unreadable; trust me, it is anything but. You could read it just for the fiction included and you would be rewarded. For example, the passage from Dostoevsky’s Notes from Underground is like nothing I’ve read anywhere. Or one of my favourite parts is Sartre’s Existentialism is a Humanism paper. (Sartre may have regretted it later, but it is a great lecture.) The entire collection is a masterpiece and a demonstration of the power of a good anthology. More over, this is a book of philosophy that is highly accessible. 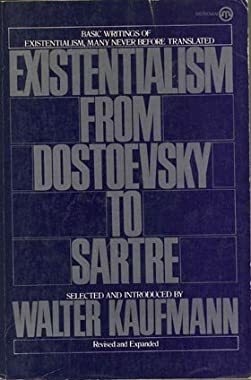 Even if existentialism isn’t for you, anyone wanting to read great philosophical writing and thinking should give this a try. I have other books of philosophy, but nothing approaches this. I think IT people could benefit from knowing more about architecture. Much of how architects think about spaces and how they relate to people could be borrowed by IT architects as they design systems for people. This isn’t a book about how to build STARchitecture. This is a book about how to make places for people to live, work, and meet. IT people can learn alot from this book. IT people would design better systems after reading this book. Of course non-IT people can learn alot from this as well. You will see your world and the buildings you inhabit in a fresh and smarter way after reading this book. And anyone who has been in a building and thought: “why is this building this way?” would benefit from this book. Again, I have other books on architecture, but most of them are historical or technical. 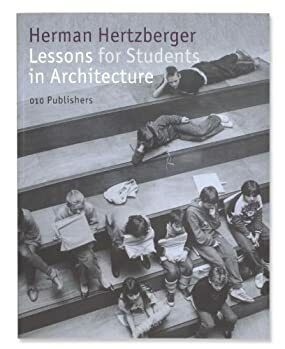 The depth and breadth of thought here is what makes Hertzberger worth reading. IT people should read more history. I am always struck by how little history IT people know. Even the history of their own industry, never mind history in general. There’s a massive pile of great history to read, but my preference is recent English historians. 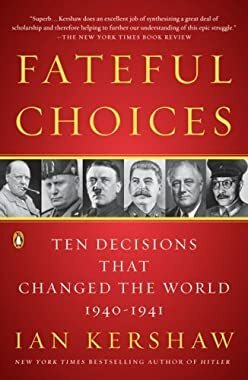 AJP Taylor, Antony Beevor, and Richard J. Evans all write with a mastery and clarity that makes them accessible and worthwhile to read for non-historians. To that list I would add the name of Ian Kershaw. His “Hitler” is a masterpiece. However, I recommend this book because it shows how history is a volatile thing at the time it is being made and not some dry carved in stone set of events. Kershaw shows the decision to be made, shows how it was discussed, and then looks at what may have happened if an alternative decision was made. It will make you challenge any other history you read after you have finished this book. If you like this, read the other authors that I mentioned. Taylor is my favourite, but some of his work is more accessible than others. I have reread his “Europe: Grandeur and Decline” so many times it has fallen apart. Beevor’s “Stalingrad” is over 600 pages and I have read it three times, it is so good. 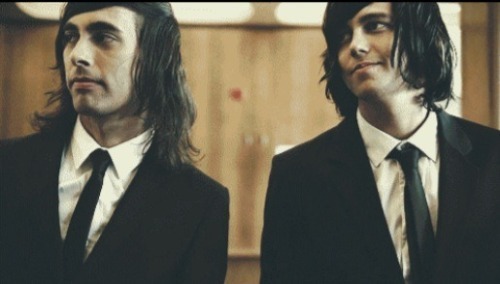 Evans is also great. I would add Margaret MacMillan and her “Paris 1919” to the list. Thanks for reading this. I hope you find something you find worth reading and thinking about. And if you are already cool, it makes you look more so.